DALLAS — Philipp Grubauer was spectacularly stubborn in goal on a night when Colorado's defence got in on the offence. 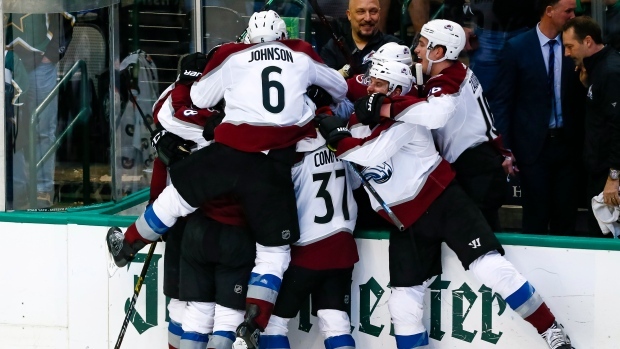 Grubauer made a career-high 44 saves, including 23 in the third period, and defencemen Erik Johnson and Tyson Barrie scored to help the Avalanche beat the Dallas Stars 3-1 on Thursday night. "Over the last couple games, just take it chance by chance and situation by situation," Grubauer said. "Read the game, scan who's on the ice. Scan where they come from. Read where the puck is going. Just simplify it." "We get a great goaltending performance from Grubauer and it's enough to win," Bednar said. "But I thought first 40 minutes especially, we did a lot of good things, and our guys are having fun right now. They want it, obviously you can see that." "I did think Colorado's desperation in the first period was above ours," Stars coach Jim Montgomery said. "In the second period, I thought it was even, and then in the third I thought our desperation exceeded theirs." "We're going to end up on the right side of the scoresheet if we keep playing this way," he said. Momentum shifted in Dallas' direction in the second period - until the Avalanche scored at 17:20. Samuel Girard sent a pass to Johnson high in the left faceoff circle. Johnson one-timed a slap shot inside the left goalpost. "I was ready for it," Bishop said. "He's just got kind of a heavy shot and just got on me quick. Maybe one I'd like to have back, but it was a pretty good shot." "Creating offence is a five-man job," Bednar said, "so we need the help from our (defence) and we got it tonight. Tyson Barrie seems to have caught fire here a little bit." "I thought we all played pretty good," Bishop said. "I thought Grubauer played excellent and kind of stole the game." NOTES: Johnson's goal, his first in 20 games, came on his 31st birthday. ... Barrie's goal was his 300th career point. ... Colorado acquired Grubauer in a trade with Washington completed during the 2018 NHL draft at the American Airlines Center, the Stars' home ice. ... Seguin's 28th goal ended a nine-game drought. He had 10 shots on goal. MacKinnon and Dallas captain Jamie Benn each had nine.